Hi, loves! How’s your week? Today I’m starting a new series called Try It Out Thursday where I post about products I wouldn’t typically try or reach for. It’s like a “give it a chance”. Future posts will include: colorful eyeliners (like white, purple, and blue liners), loose pigments, glitters, mixing mediums, glitter lips, bold lipsticks, etc. Basically products I don’t typically dare to use on a day to day basis. So first up is red gel liner! Now, I’ve seen red liner on fashion shoots and online but it’s not something I would have dared to wear. I decided to give it a try since it was around Halloween (when I first wore it). I was really self conscious at first but I ended up loving this! I used a gel liner from Makeup Geek which I will review later, but honestly it took way too long to dry, was very wet and transferred easily. Red gel liners are hard to find but I know Inglot has one that looks really nice. The easiest way to wear red liner is on its own. The color is so bright and gorgeous that it stands out, looks great, and you don’t need to do anything else. Another easy way to wear red liner is with neutral colors. I paired it with brown eyeshadow here. I also wanted to do a look with complementary colors but I do not own any red eyeshadows. I just got Cranberry from MAC though so I might do an updated look later. Lastly, a really cool way to wear red liner is with black liner. Any color liner looks good peeking under some black liner. It’s the most subtle way to wear red liner because not much color is showing. I used liquid liner here. I was then inspired by a picture I saw on Tumblr (here) to pair it up with red lipstick. At first I thought it would be too much red and overkill, but I ended up loving it! I got compliments on it as well. I was so happy. Hope this new series will inspire you to try makeup that is out of your comfort zone! I've been wanting a red liner for such a long time. 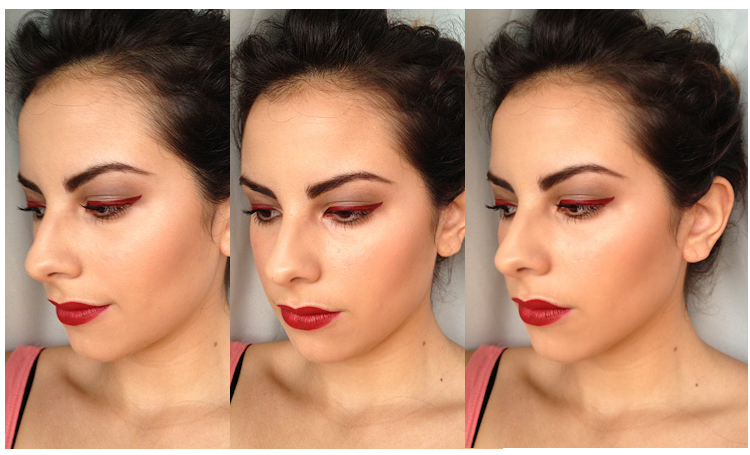 I am a longtime lover of red eyeshadow (ever since I wore NARS' sadly-discontinued Emmanuelle to my junior prom! )and I've been itching to break out into the world of red eyeliners. This looks gorgeous on you, I especially love how you've paired it with a black liner in one of your looks; very bold and graphic! Love the intensity of the red! You are being followed! your so brave! It looks lovely, but don't think i'm as experimental nor confident enough to pull red liner off! This looks amazing. Red really suits you! Might sound a bit weird but your eyebrows are lovely haa. hi Coco, thanks for passing to my blog! This red gel liner is gorgeous O___O sadly Makeup Geek is not available in Italy but I know MUFE has a red aqua liner! This actually works on you, I'm seriously impressed! Not sure too many people could pull that off but you really do! This colour looks gorgeous on you! I tried pink eyeliner once and it made me look like I got hit in both eyes… I just can't pull it off! Thanks for the kind words on my blog earlier- just started following yours! It looks really nice! I tried it once by mixing water and a red baked eyeshadow. I liked it a lot. Love the gel liner and the red lip! It's so pretty! Oh my goodness, I would NEVER think so otherwise before seeing this but that red liner looks absolutely STUNNING on you! Love love loveeee! I've always wanted a red eyeshadow, and now I'm thinking liner is what I need! I cannot believe how gorgeous that looks with red lipstick. You're so brave!